NU: Claridge 13-73; Young 12-86; Ross 7-19; Johnson 4-45; McCloughan 8-34; Martin 3-11; Powers 5-59; Theisen 3-13; Paschall 2-19; Sebastian 1-6. NU: Claridge 4-14-1 75; Theisen 1-1-0 15. CU: Symons 14-27-1 150; Ethridge 0-1-0 0. NU: Callahan 2-30; Tomlinson 1-22; Comstock 1-11; Eger 1-27. CU: McGuire 6-73; Mavity 2-28; Blair 2-26; Wissmiller 1-12; Irvine 1-9; Melville 1-4; Harris 1-minus-2. Colorado became the third team in as many games to surprise the Cornhuskers and force come-from-behind efforts. Heavy favorites to make the Buffs victim No. 6 – ensuring the first winning season since 1954 – Nebraska was foiled by miscues and penalties in the first half and couldn’t get its potent offense rolling. And some fine running by Leon Mavity and Bill Symons gave CU a 6-0 halftime lead as the Buffaloes surprised a homecoming crowd in Boulder by twice stopping NU threats. But again the Huskers’ superior depth turned the tide, with Nebraska erupting for 23 points in 10 minutes of the third period and adding another TD in the final period. The turnaround began when end Jim Huge, who had dropped a fourth-down pass at the goal line in the final seconds of the first half, recovered a Colorado fumble on the CU 28. On the next play, Rudy Johnson ran off left tackle for a touchdown. On Nebraska’s next possession, Dennis Claridge circled left end on a keeper play for 30 yards and a touchdown, ending an 80-yard drive. Less than a minute later, CU quarterback Frank Cesarek was tackled in the end zone by Larry Tomlinson for a safety while trying to pass. 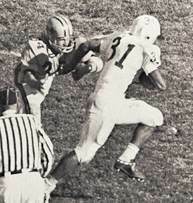 Two minutes later, NU scored on an 11-yard Claridge pass to Bill Comstock. H’MAX NOTES: How unusual was the Huskers’ 23-point third quarter? NU had scored that many points in an entire game just seven times in the previous seven seasons (1955-1961). … Don’t miss the footage of the Huskers’ wild double extra point. … After the win, the Huskers moved up to No. 10 in the UPI coaches’ poll and were just two spots out of the AP poll, which ranked just 10 teams.